His Holiness Karekin II Catholicos of All Armenians is currently in Astana, Kazakhstan, participating in the Congress of Leaders of World and Traditional Religions. The Supreme Patriarch was to make a report on September 12 2006 titled "Freedom of Faith and Respect to Followers of Other religions". On the final day of the congress on September 14, leaders of religions made a joint statement emphasizing the need "to fight against biased approaches and ignorance". Informing about the leaders’ statement, Turkish Hurriyet newspaper wrote in September 12 issue that more than 150 journalists covered the works of the Congress, and its end was marked by Karekin II’s "propaganda of the so-called genocide". "Availing of the right of final speech, Karekin II Catholicos could not resist the temptation of speaking touching upon the genocide issue. ‘Despite the genocide of 1915, persecutions and pursuits, Armenians remain faithful to what they believe,’ he said. Leaders of Orthodox churches as well as Yona Metzger, Ashkenazi Chief Rabbi of Israel, welcomed Catholicos’s speech with applauses. "The Armenian Catholicos who expresses the mood of the Armenian Diaspora uses every occasion to defend the genocide thesis. In Istanbul a lawsuit was filed against him for insulting Turkish national self-esteem. His meeting with Greek Patriarch Bartholomeos during his Istanbul visit incited lively discussions." The Department of Inter-Church Relations of the Mother See of Holy Etchmiadzin reports that an inter-faith theological conference entitled "Constructive Interaction Among Divine Religions" is being held in Isfahan, Iran from March 18 to 19, 2006. Representatives of Islam, Christianity and Judaism, as well as the Hindu and Zoroastrian faiths, will be participating in the conference. Also participating will be the spiritual leaders of ethnic and religious minorities living in Iran. His Eminence Archbishop Nerses Bozabalian of the Brotherhood of Holy Etchmiadzin has been assigned by His Holiness Karekin II, Catholicos of All Armenians, to represent the Armenian Church and the Mother See at the conference, and will be presenting his paper to the participants entitled the "Role of Religion in the Order of Social Life". On October 9, 2005, His Holiness Karekin II, Supreme Patriarch and Catholicos of All Armenians, sent letters of condolence to the leaders of Pakistan and India following the great earthquake which struck the region of Kashmir on Saturday. Addressing his letters to President Pervez Musharraf of Pakistan and Prime Minister Manmohan Singh of India, the Pontiff of All Armenians expressed his sorrow and pain for the tragic loss of life, countless casualties and immense property damage inflicted on their countries. On December 8, His Holiness Karekin II, Supreme Patriarch and Catholicos of All Armenians, received a group of 30 Turkish scientists, journalists, authors and intellectuals in the Mother See of Holy Etchmiadzin. The delegation from Turkey were members of the "Eastern Assembly Initiative" who are in Armenia accompanied by Hagop Dink and Ara Kochounian, editors of the Istanbul-based "Agos" and "Jamanak" newspapers respectively. Mr. Dink introduced the delegation to His Holiness and expressed the gratitude of the group for the audience. He noted that the intention of the participants was to become better acquainted with their neighboring country and people, and their cultural, economic, political and religious life. The Catholicos of All Armenians welcomed the guests and greeted the initiative stating, "An important mission is reserved for intellectuals in the spheres of education and instruction, in the internal national and public life of each country, as well as in the formation of mutual relationships between countries and peoples, and in their progress and development." During the meeting, in response to questions from the Turkish delegation, His Holiness presented the mission of the Armenian Church throughout the world, focusing on the difficulties during the Soviet years, and the new opportunities and challenges in the present day of Armenian independent statehood. Special mention was made by His Holiness of the pan-national nature of Armenian life and the work of the Mother See of Holy Etchmiadzin in inter-church and inter-faith ties. With regards to the current state of Armenia-Turkey relations, His Holiness specifically emphasized the Armenian Genocide, and stressed that the genocide is a historical fact which cannot be a point of debate. Regarding international conflicts in the region, as well as in the Middle East, the Pontiff of All Armenians underscored the necessity of not attributing a religious nature or religious grounds to these disputes. His Holiness stated that an excellent path to resolving and settling these conflicts would be through inter-faith dialogue. Concluding his remarks, His Holiness Karekin II extended his best wishes for the success of the mission of the "Eastern Assembly Initiative". Present for the meeting were His Eminence Archbishop Grigoris Buniatian, primate of the Armenian Diocese of the Ukraine, and His Grace Bishop Arshak Khatchatrian, Chancellor of the Mother See. On the afternoon of September 9, His Holiness Karekin II, Supreme Patriarch and Catholicos of All Armenians, received Mr. Mohammad Khatami, President of the Islamic Republic of Iran and his delegation of high-ranking dignitaries. President Khatami thanked His Holiness for the reception, and spoke of the strong relationship between the two countries and the further reinforcement of those bonds. "My visit to this holy place has genuinely increased the depth of significance to my visit to Armenia", noted the President of Iran. His Holiness welcomed President Khatami, and referred to the mission of the Mother See in the life of the Armenian people: "Holy Etchmiadzin is the very soul of the Armenian individual. It is the beating heart of the Armenian body. The sons and daughters of our nation dispersed throughout the world, when making the sign of the cross, have always directed their gaze toward their spiritual home, toward Holy Etchmiadzin". The Pontiff of All Armenians expressed appreciation for the careful attitude of the Iranian authorities towards the Armenian community of Iran. His Holiness further noted his joy in the continued development and progress of relations between Armenia and Iran, and stated his hope that the ties be fostered and strengthened for the welfare of both countries. During the course of the meeting, both leaders placed great importance on the role and mission of spiritual leaders in the peaceful solution of regional conflicts and issues. Also in attendance during the meeting were His Grace Bishop Sion Adamian, Primate of the Diocese of Armavir; Very Rev. Fr. Anushavan Jamkotchian; G. Gharibjanian, Ambassador of the Republic of Armenia to the Islamic Republic of Iran, and A. Hadidian, Ambassador of Iran to Armenia. 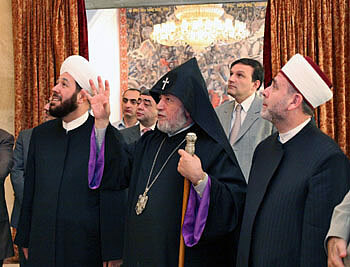 On March 3, the Second Inter-Religious Peacemaking Forum concluded its meetings in Moscow. Participating in the Forum was His Holiness Karekin II, Supreme Patriarch and Catholicos of All Armenians, as well as spiritual leaders from throughout the CIS countries. During the first session, the participants discussed the following topics in small working groups: "The Current Situation of Church-State Relations in the CIS", "Coordination of Traditional Religions in Response to Common Challenges", "Social Services of Religious Organizations" and "Concerns on Religious Education". The second session was highlighted by the discussions of three specific topics: "Spreading the Experiment of Inter-Religious Cooperation to Regional Levels", "Religion and Mass Media" and "Peacemaking Efforts of Religious Organizations". The participants presented their results and reports during a final plenary session. In addition, one important decision reached by the Forum was announced during the closing session. An Inter-Religious Council will be formed, with the aim of working to find ways of cooperation between the international and religious community. Some key goals are to conduct joint activities among the traditional religious organizations functioning in the CIS countries, increase dialogue between spiritual leaders, uniting efforts in the struggle against common challenges, encouraging the strengthening of traditional spiritual values in society, regulating Church-State relationships, cooperation in the spheres of peacemaking, and exchanging experiences and ideas in the sphere of social services. The newly formed council consists of 22 spiritual leaders from throughout the CIS, among them are His Holiness Karekin II, Catholicos of All Armenians; His Holiness Alexy II, Patriarch of Moscow and All Russia; His Holiness Ilia II, Catholicos-Patriarch of All Georgia; Sheikh Ul Islam Allah-Shukur Pashazade, Spiritual Leader of Muslims in the Caucasus, as well as the spiritual leaders of the Ukraine, Belarus, Moldova, Uzbekistan, Kazakhstan, Kyrgyzstan, and Tajikistan. Four Co-Chairmen representing the four traditional religions of the CIS countries - Christianity, Islam, Judaism and Buddhism, will jointly coordinate the activity of the Council. On March 1, His Holiness Karekin II, Supreme Patriarch and Catholicos of All Armenians, departed for Moscow to participate in the Second Inter-Religious Peacemaking Forum, scheduled for March 2-4 in the Russian capital. Participating in the Forum will be spiritual leaders from the CIS countries, clergy, representatives of inter-religious international organizations, as well as state officials, scientists, academicians and public figures. His Holiness is accompanied by His Eminence Archbishop Barkev Martirossian, Primate of the Diocese of Artsakh; His Grace Bishop Yeznik Petrossian, Secretary for the Department of Inter-Church Relations for the Mother See of Holy Etchmiadzin; His Grace Bishop Navasard Ktchoyan, Vicar General of the Araratian Pontifical Diocese; His Grace Bishop Yezras Nersissian, Primate of the Armenian Diocese of New Nakhijevan and Russia; Rev. Fr. Vahram Melikian, Director of Information Services of the Mother See; Mr. Rafael Papayan, Member of the Constitutional Court of the Republic of Armenia and Member of the Supreme Spiritual Council of the Mother See; Mr. Karen Nazarian, Adviser to the Minister of Foreign Affairs of the Republic of Armenia; and Mr. Levon Mkrtchian, Member of the National Assembly (Parliament) of the Republic of Armenia. The main goal of the Inter-Religious Forum, convened for the second time since 2000, is to contribute to the maintaining and fostering of peace between the religions and the peoples of the CIS by means of cooperation and dialogue, as they seek to foster stability and unity in society through the strengthening of traditional spiritual values. On the agenda of the forum is the formation of an Inter-religious Council comprised of more than 20 spiritual leaders.